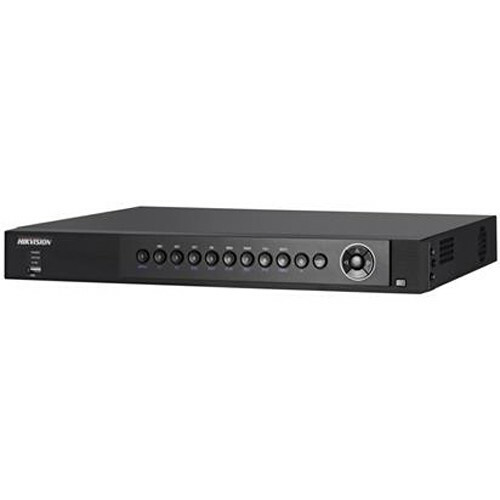 The Turbo HD Tribrid 1080p 4-Channel DVR from Hikvision lets you configure, record, and play back footage from up to four cameras. The NVR features an Ethernet interface to support IP cameras along with a BNC interface for use with HD-TVI over analog cameras. It is compatible with cameras that broadcast 1080p, 720p, or analog resolution video, and it offers one RCA input and one RCA output for 2-way audio capability. Additionally, there are HDMI and VGA connections for video output in high definition, with support for dual streaming to maximize bandwidth efficiency. H.264 recordings can be stored using a SATA interface HDD. Furthermore, a USB interface provides external storage options and allows you to export recorded data.